A Chemical Peel is a non-invasive technique for restoring wrinkled, blemished, unevenly pigmented, or sun-damaged facial skin. A chemical solution is used to peel away the skin's damaged outer layers. The new cells and collagen are stimulated during the healing process to produce a smoother, tighter, younger-looking skin surface. Chemical peels can be used on the entire face or on specific regions such as the forehead or areas around the mouth. A peel does not eliminate sagging or excess skin. Each treatment is customized for patient skin type, specific problem areas and the delicate areas of the face. The depth of the peel is dependent on the concentration and type of acid, and a person's skin type and sensitivity. Treatment issues will be discussed during your consultation. Aesthetic Laser Care offers mild to moderate strength TCA Peels and the Vitalize Peel from Skin Medica for $125/each and the stronger Rejuvenize Peel from Skin Medica for $175/each. These peels are mild and will enhance appearance by providing smoother, brighter-looking skin. 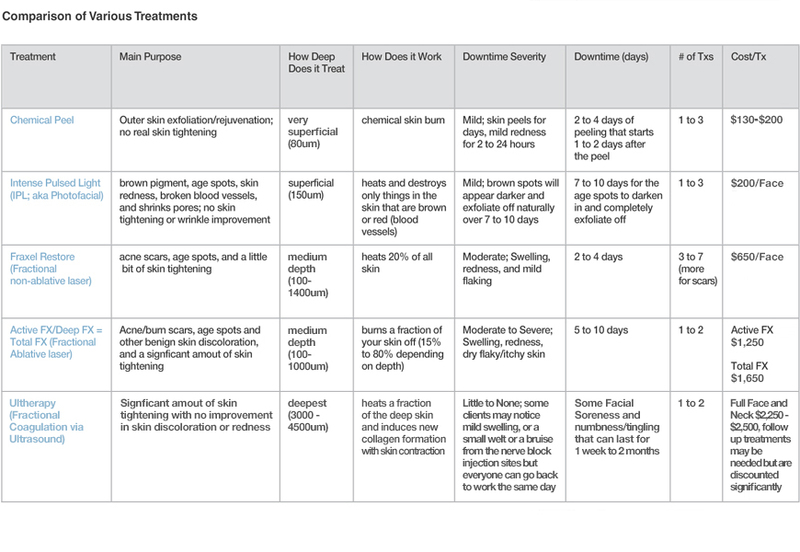 Experience has shown that when a series of peels are performed within a short time interval, the effect is greater than one deep peeling procedure with a long and inconvenient recovery time. Improvements from peels may be very subtle at first. At first, you may detect a healthier glow to your skin. With continued treatments, you will notice a general improvement in the texture of your skin. • Each individual will respond a little differently to the peel series. • The procedure takes approximately 20 minutes. • A minimal amount of redness and tingling develops, which ends within one hour. • Within 2 to 4 days, a light peeling is faintly visible and lasts about 1 to 3 days. • A series of 2 to 6 peels may be needed to achieve satisfactory results. The peels are administered at two to six week intervals for maximum results. • If you have a history of herpes, you should inform Dr. Lafkas or his staff prior to the procedure. • No make-up should be worn to the office. • The skin is cleansed thoroughly to remove all oil and debris. • You may experience some stinging, redness, irritation and crusting. • It is common to experience some temporary flaking or scaling, redness and dryness of the skin. • Do not touch or peel the flaking skin. • Frequent face washing with water and soap is discouraged (dries the skin too much). • If drugs for herpes were prescribed, the course of treatment should be completed. • You may return to normal activities. • Use recommended skincare products as instructed to keep the skin clean and moist. • Begin a regular program of sunscreens and sun protection. • Avoid sun exposure during your series, and for two weeks after completing the chemical peels.